Fadi Hindash directed the short documentary ‘Mama Agatha‘. This heart-warming film is about migrant women in Amsterdam learning to ride a bike. Cycling means more freedom, and integration in Dutch society. Women of all ages and nationalities are taught by teacher Mama Agatha. 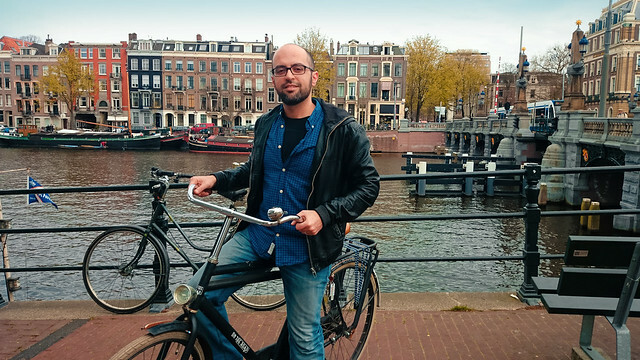 Most of his life Fadi lived in car dominated Dubai, but three years ago he moved to Amsterdam. He was not able to cycle, but learned it from Mama Agatha herself. The premiere of ‘Mama Agatha’ will be on the 2nd of May during Leiden International Short Film Experience. Reason enough to make Fadi our cyclist of the month! How did you come up with this topic for the documentary? I was having coffee on my friend’s terrace overlooking a park where a group of Moroccan women were learning how to ride a bicycle. Immediately I was struck with how much that image said about integration and the life of migrants. I personally moved to the Netherlands 3 years ago but I have grown up with the identity of a migrant long before. I was raised in Dubai where my family and I lived as outsiders in our own home which is why the issue of integration is one that is very close to my heart. So when I saw the group of Arab women learning to cycle in Amsterdam, I immediately knew there was a story there for me. The fact that it looked so sweet and humorous set the tone for the film. Plus, I also never learned how to cycle because Dubai is a city of cars, which made the film even more personal as I was going through what the women were going through. Why is it important to learn to ride a bike? Because it gives you freedom, not just physically but also emotionally. Cycling feels like flying, on wheels. I don’t see any men in the documentary, are these cycling lessons just for women. If so, why do you think that is? I had the same question during filming. As far as I know there aren’t similar courses for men. It could be because men tend to be more proud about admitting they don’t know something so basic or they would feel more embarrassed about falling in the street. I was lucky to have Mama Agatha as a teacher, she taught me behind the scenes while making the documentary. It’s the perfect combination of a city and a little town. It’s cozy when you need it to be but also cosmopolitan when you need it to be. There’s also the other factor that cannot be put into words: it has this magic quality to it. It looks so pretty, almost like a dollhouse. I love things that seem unreal with a touch of fantasy, that’s the filmmaker in me. The premiere of Mama Agatha takes place on the 2nd of May at The Leiden International Short Film Experience at 14:45. Interested in organising a screening of ‘Mama Agatha’ yourself? This entry was posted on April 18, 2015 by amsterdamcyclechic. It was filed under Cycle Chic Spotlight, Cyclist of the month, Dutch Cycling Trends, Girls on bikes and was tagged with Amsterdam cycling, Amsterdam Zuidoost, Dutch bikes, Dutch cycling culture, Fadi Hindash, integration, mama agatha, migrant women, the sound of applause.